I have almost as big of a soft spot for the cute and fuzzy as I do for the terrifying and ferocious. For that reason, I thought it was important to introduce you to the squeest, fuzziest little critter in Magic. Squirrels have a long tradition in Magic. While this little guy is more likely a chipmunk, not actually a squirrel, I think he falls into the same category when it comes to the fans of the fuzzy. We do love our squirrels (and cats!). Before you get too excited, I should warn you: although adorable, the above art by Aaron Miller isn't the main focus of the card. This is not the announcement of a new Squirrel card or token. This little guy is just part of the beautiful Ajani, Mentor of Heroes art. It's the little touches, like this, that make our artists truly extraordinary. Did this image need a chipmunk running away from the giant kitty? Nope. Is it more complete and interesting with the little fuzzball included? Yes. The addition tells a story and humanizes (uh, leonizes?) the image. I was once told by an art teacher (hi Jamie!) that when you paint a stuffed animal or small critter, the viewer is inclined to start making up a story in his or her head. It's not a conscious thing, it just happens automatically. 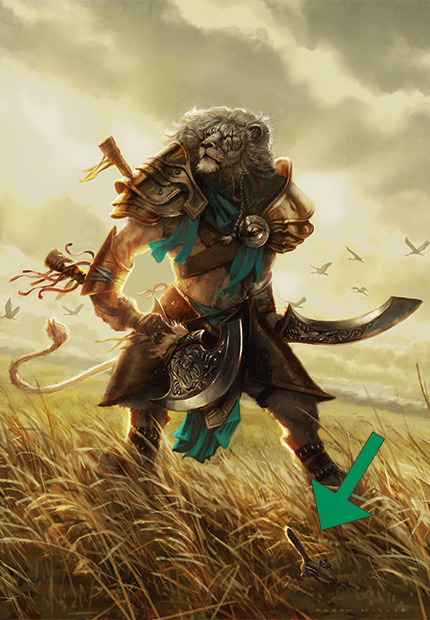 Ajani, standing there, stoic, wind in his mane, sun warming his fur (and armor—ugh, I bet he's hot...), is beautiful but doesn't tell a story. Add in the chipmunk, that was obviously hiding then suddenly decided to run, and you start to wonder: What did Ajani do to startle it? Was he walking and stopped suddenly because he heard something? Did he almost step on it? 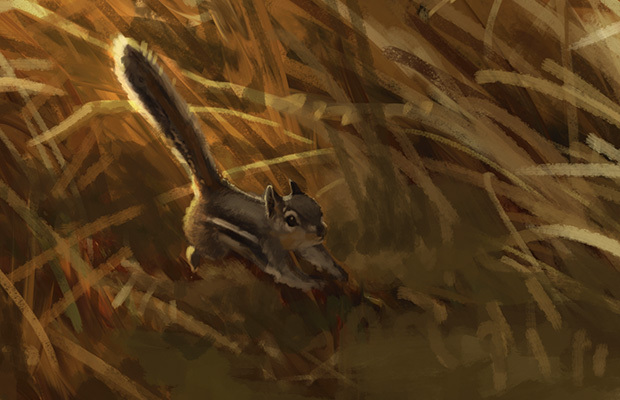 Is the chipmunk leading him on toward something and he's looking back to map his path? It makes me wonder, and wondering about the story is a sign of truly great art.